We've got exciting news, cheer and dance fans: NCA & NDA are proud to introduce a NEW division being implemented at the 2019 NCA Senior and Junior High School National Championship, the Spirit Program Division! 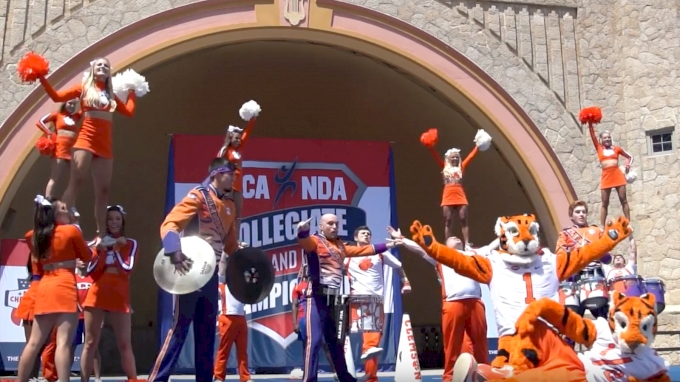 Last season, NCA & NDA released new Game Day Divisions for the Collegiate National Championship in Daytona Beach, Florida. The game divisions were a major success and NCA & NDA made the decision to bring a similar game day competition to the high school level. Game Day Stole The Show At NCA & NDA College! The new Spirit Program division not only allows the use of traditional sideline cheer and dance teams, but also the incorporation of members of the school Marching Band, Pep Band, Drum Line, Mascot(s), Spirit Group/Club, etc. The primary responsibility of Spirit Programs is to develop and implement effective methods of generating excitement and often requires close coordination between various campus groups. NCA & NDA now offer a way to showcase this at the NCA Senior and Junior High School National Championship. For examples of teams competing in this format at the collegiate level, CLICK HERE. Will your school take part in the new Spirit Program divisions this year? We can't wait to see you bring your school's game day style to the competition mat!